Here we go! 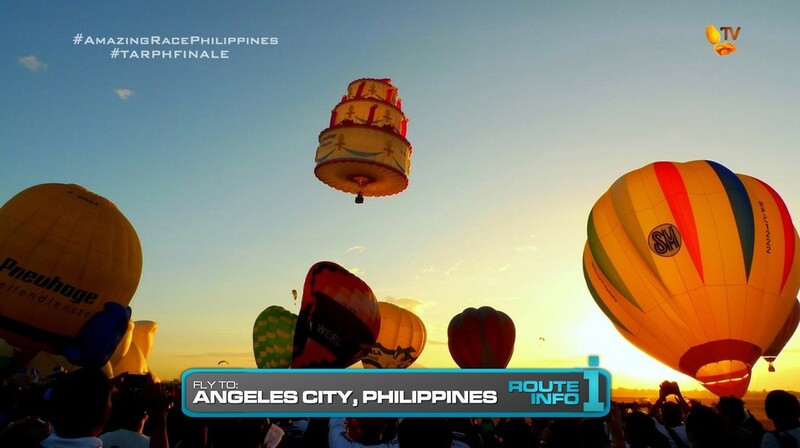 The Final Leg of The Amazing Race Philippines All-Stars! Teams will be flying back to the Philippines by first taking a Dragonair flight from Beijing to Hong Kong. They will then hop onto a Cebu Pacific flight to Clark International Airport in Angeles City, Pampanga, arriving at 11:35am. Once at Clark, teams need to follow the hot air balloons and make their way on foot from the main terminal to the open field. The Philippine International Hot Air Balloon Festival is held annually here at Clark. For the first task on this Leg, teams will get into one of the marked hot air balloons. Each of them has a locked box containing their next clue. 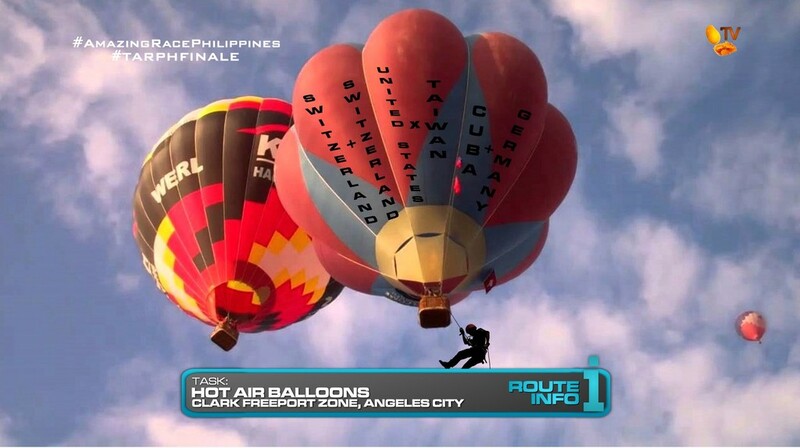 To unlock the clue, teams will need to find the hot air balloon with the same colors as their box. On that hot air balloon are three equations using the countries visited on this season of the Race. Teams must figure out each country represents a Leg. Converting the countries to Legs and figuring out the equations will reveal the five-digit code they need to unlock the clue. Teams will only be able to see the equations from their hot air balloon. Once they’ve unlocked the box, both team members must first rappel down from the basket before opening the clue envelope. The next clue reveals the Road Block: Who wants to drift away? At this point, the Road Block is essentially set to zero and either team member may complete this one. 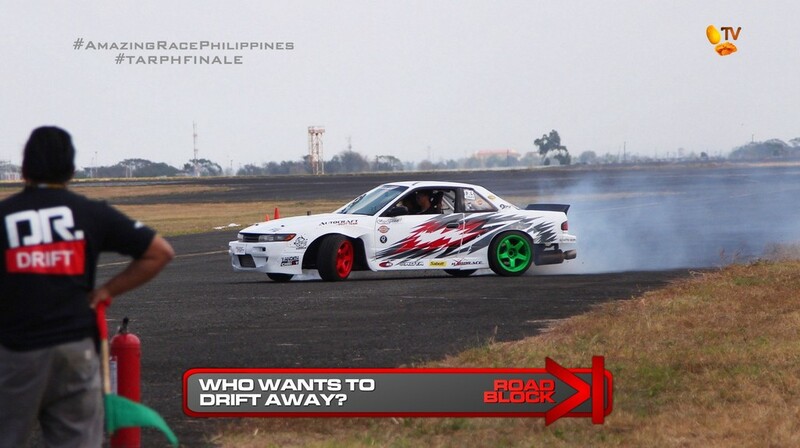 For this Road Block, teams will join a professional as they participate in a drifting routine. Once they’ve successfully completed the routine with no mistakes, they will be given their next clue. Teams must now choose a brand new 2016 Kia Grand Carnival minivan and drive themselves to Puning Hot Spring. 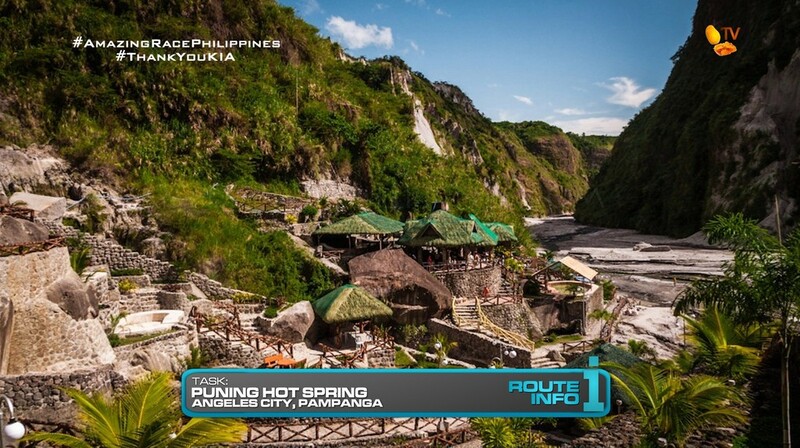 At Puning Hot Spring, teams will chose a 4×4 offroad vehicle and search the rough terrain for a “bright star that will guide you.” Teams will need to figure out that they are looking for a traditional Filipino parol. Once they’ve spotted the parols, they must take one (which has a clue attached to it) and return to the resort. 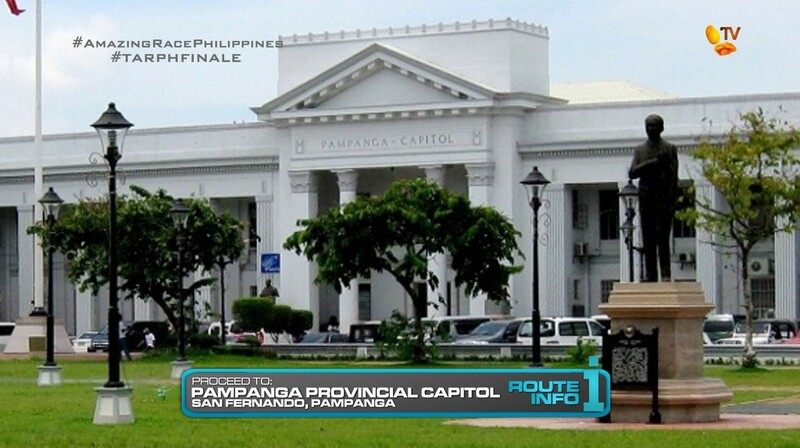 Teams must carefully load their parol into the van and drive themselves to the Pampanga Provincial Capitol. And here, teams will find another Road Block: Who feels enlightened about the Race? The team member who did not complete the drifting Road Block MUST do this Road Block. 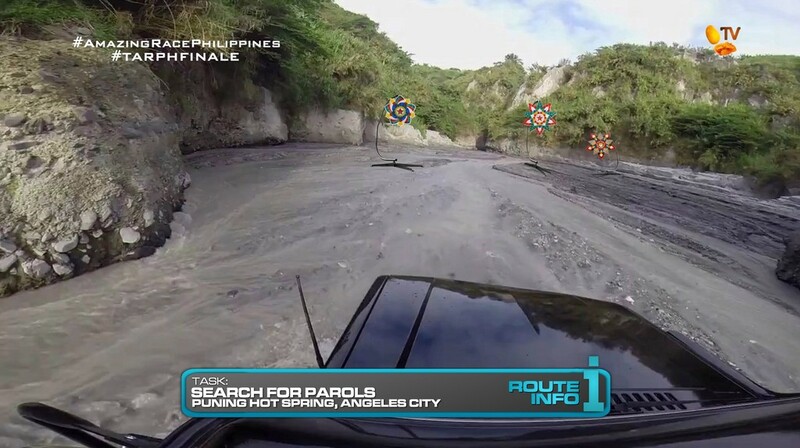 For this Road Block, teams must search this sea of parols for 11 parols that represent each of the previous 11 (!) Legs of the Race! Each parol depicts a specific task from each of the 11 Legs. Their clue will tell them whether a certain Leg’s parol is one that represents a Road Block, Detour, Rewind, Intersection or Active Route Info task. 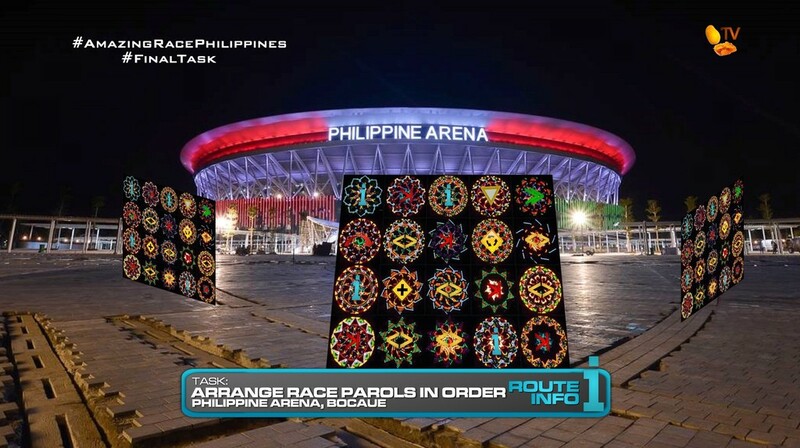 Once their 11 parols are approved, they must carefully package them for transport, load them into their 2016 Kia Grand Carnivals and drive themselves to the Philippine Arena in Bocaue, Bulacan. 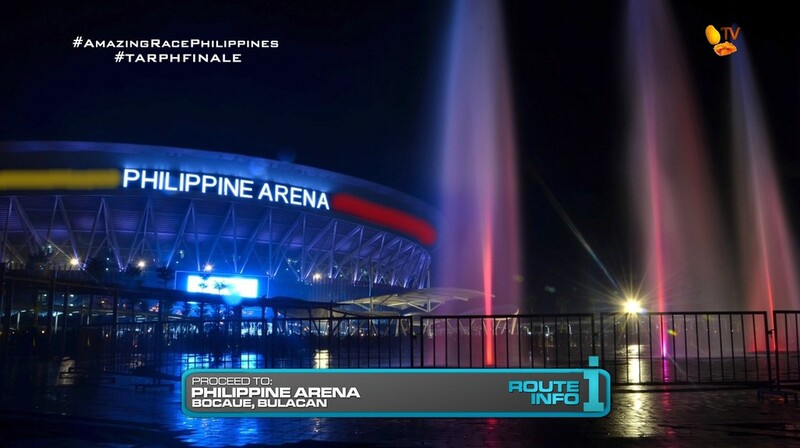 And right in front of the Philippine Arena, teams will encounter their FINAL Task. For this task, teams will find a large grid where nine parols are already plugged in and hanging. Teams must now arrange the 11 parols they’ve brought with them and the nine already hanging in chronological order they appeared on the Race. Once teams have their 20 parols in the correct order, they will be handed the FINAL CLUE! 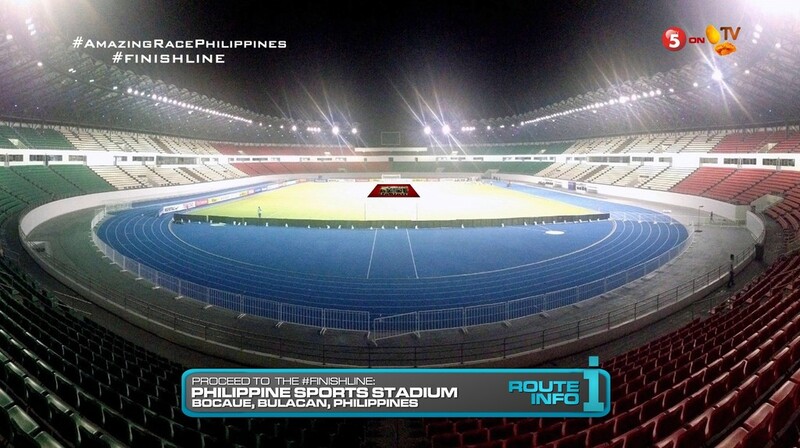 And that Final Clue tells teams they can run to the Finish Line, right where it all began, the field of the Philippine Sports Stadium! 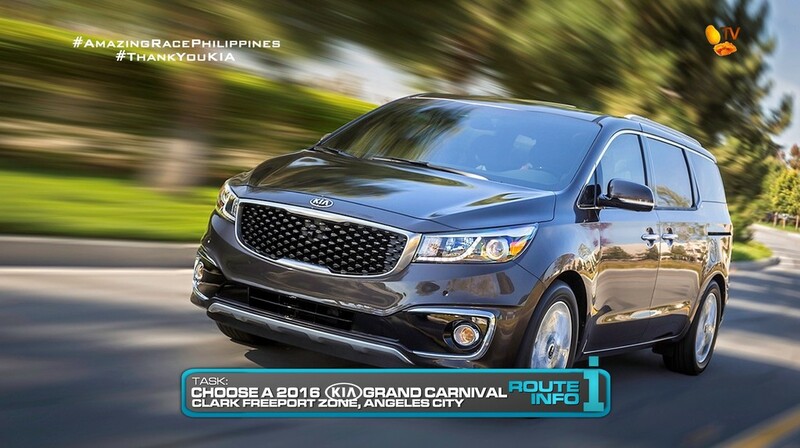 The first team to cross the Finish Line will win two brand-new 2016 Kia Grand Carnivals, two fully furnished house and lot properties from RCD Royale Homes, a Samsung Galaxy package (Galaxy S6 phones, Galaxy Notes, Galaxy Gears and two laptops) worth more than P125,000, one year of unlimited voice, data and messaging from Smart, one year of free Jollibee worldwide, a trip for four to any country visited this season courtesy of Travelocity AND! P2 million courtesy of PLDT Home Ultera. And let’s hope the winners of this All-Star Race are 10x better and more deserving than the winners of TARUS’ All-Star races. Hehe. So before we get to those parols… Teams flying directly into Clark is definitely a logistical necessity to allow for all the parol tasks before heading to the Philippine Arena/Stadium. Of course, San Fernando is known for its parols. And teams flying into Manila instead would cause unnecessary trouble with its distance and traffic. 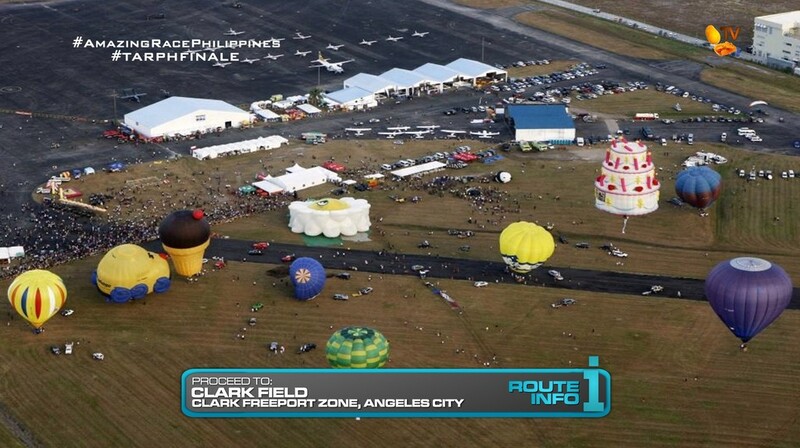 Flying into Clark ends up being perfect as we can use the hot air balloon festival which is held there every year. The only possibly problem is that hot air balloons depend largely on the weather. So if it’s not a good day, then that entire task will need to be scrapped. But let’s just assume everything goes perfectly. The catch of this task is teams needing to be aware of the Leg numbers so they can calculate the correct numbers needed for the code. That’s why there was a clear distinction that Cuba was ONE huge SuperLeg, Leg 5. Best-case scenario is teams will mess up somewhere in their Leg numbering and we can get some drama right at the start. Needing an extra task for the Leg, the drifting is a simple, straightforward task in the same area. And making it a Road Block is also great to trip up teams who won’t be able to choose who gets to do the memory Road Block with the parols later on. The 4×4 at the Puning Hot Spring resort is basically just to add another task and to add a little bit more adrenaline to the Leg. The parol Road Block is pretty straightforward. The original (very fitting for the them) location was the Paskuhan Village in San Fernando, but I can’t find any info on whether or not it’s even open still. 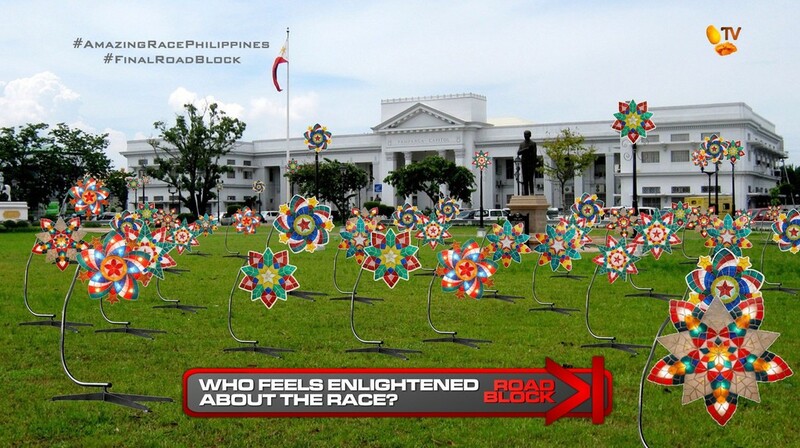 The field in front of the capitol looks good enough for a sea of parols though. And finally, the Final Task in front of Philippine Arena. The pic up top shows the task being held right in front. But really, the large grid of parols will be set up at these open patches of gravel near the arena and stadium. I think the area was/is used as parking and will be part of the big development in the future. But that’s just a detail. The task itself should be very challenging. Teams will need to know exactly which order tasks appeared on the Race. Whether some Road Block came before a Route Marker or a Detour came before an Intersection. It should be a good challenge. And having it right outside the stadium is great. Best case scenario is the three teams will be neck-to-neck (hehe) and we get a great footrace to the Finish Line inside the stadium. Great to have the Starting Line and Finish Line in the same place eh? Fits with China being the first and penultimate Leg. And so, this All Star season of The Amazing Race Philippines is over! Overall, I think this was a good route with some great tasks! The route is long, and definitely expensive. So this is probably unfeasible for any TARPH season. But since this is a DryedMangoez edition, money is no object. Haha. I did try to keep the route as manageable as possible. But even with the two-Leg-countries, it was still pretty pricey. Anyway, this was again lots of fun in my free time. With the reports of TV5 in their own crisis, it’s very unlikely TARPH will see another season. But I would much rather TARPH stay at two seasons than for either ABS-CBN or GMA to get their grubby hands on the franchise and ruin it. Ewe. It’s TV5 or nothing for TARPH. =) Woohoo!